In the last six or so months I've really devoted my time to writing short stories and have managed to see two of them published. (Yey!) Which has been really great fun and rewarding, so much so that I was starting to forget why I started writing them in the first place. Ultimately my aim is to one day publish a novel. To do that I had to get good at writing, really good. Which only comes with practise, I've read somewhere that states if you want to master a craft you need to put in a bare minimum of 1,000 hours of practise. So you have to be very focused, dedicated and incredibly stubborn. 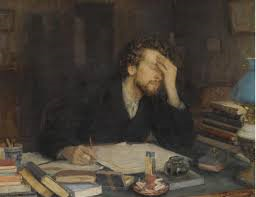 So I think the time has come to start on the dreaded second draft of my novel. I have't looked at it for months and I hope that when I read it I'll hopefully still find it worthy of my blood, sweat and tears. For me, the joy I experience with writing is that you have to get inside your story, live it as much as possible. This isn't too much of a task with short stories but with writing novels you literally have to step into a another world. It's necessary to go beyond, through the looking glass rather than just looking inside. All in all its going to be a journey - Lord of the Rings style. Not only will there be massive rewrites, plot changes and hard decisions, there's also the need to do background research. A huge revision of Grammar rules and Punctuation usage, this has never been my strong point. How to Flex Those Literacy Muscles?